Thank you for considering a donation to the ministry of HopeFM, Woodstock. Donations can be mailed OR brought into our studio at 1038 Parkinson Road, Woodstock ON N4S 7W3. 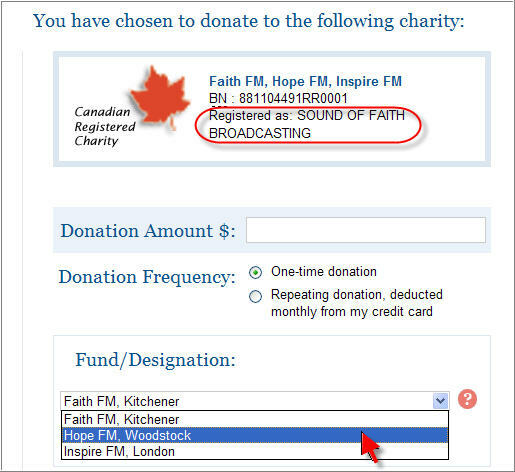 When you go to the Canada Helps website you will see that HopeFM is only one of three stations in Southwestern Ontario under the umbrella name of Sound of Faith Broadcasting. The three sister stations are FaithFM in Kitchener, HopeFM here in Woodstock and FaithFM in London. When you make your donation we would appreciate it if you would open the drop-down menu and select HopeFM as your designation. Thank you! We appreciate your gift more than you can know. More information from the Canada Helps website about how HopeFM gets the funds you donate and how you get your receipt for income tax purposes. How much of your donation actually gets to HopeFM?